NOTE: THIS IS OUR INFO PAGE. 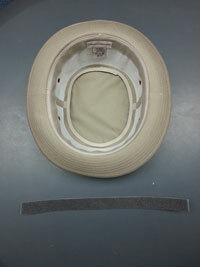 To BUY HAT SIZE REDUCER TAPE please click on the picture directly below to be redirected to our product page! What is Hat Sizing Tape? 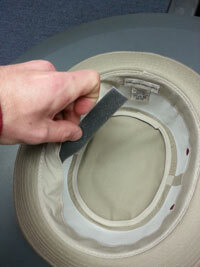 Hat sizing tape, or often called hat size reducer, is commonly used in our stores to reduce the size of any particular hat about one full size. 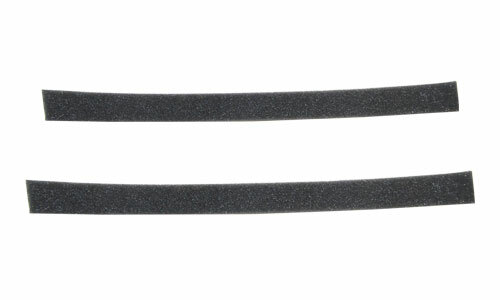 It comes in the form of a foam strip with an adhesive backing. While it is always better to try to find the right size hat for your head, there are occasions where you like a particular hat but it is only one size or only comes in half sizes, i.e. (SM/MD, LG/XL). 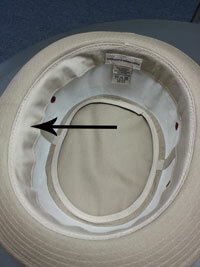 The example shown below shows how to properly use hat sizing tape on a bucket hat with a band. 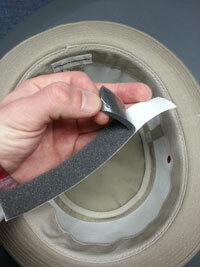 We would like to note, however, that you can use hat sizing tape on hats without an interior band as well. Click HERE or on the image below to BUY HAT SIZING STRIPS! 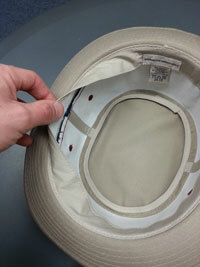 Cut a strip of sizing tape at the approximate circumfrence of the inside of your hat. Many times you only need enough for each of the sides as this is where most people have a sizing problem. To break the process down into parts and make the operation easier, cut the sizing tape strip in half. 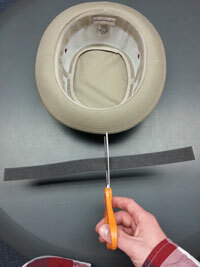 As stated in the first step, it is best practice to insert the foam strip underneath the band in order to: A) disguise that it is there at all, and B) to retain the original fabric as the liner between your head and the hat. This being said, you can still use sizing tape on hats without and interior liner but we suggest that you place is slightly higher up inside the hat so that the tape doesn't show when it is on your head. Before we make any semi-permanent size modification to the hat, place the strips of sizing tape where the hat is largest around your head. Simply place them under the band and fold the band back on top of the sizing tape. Now try the hat on and see if where you have placed the strips feels comfortable or gets the job done. If it doesn't, readjust the foam strips and try again. NOTE: you can also cut these strips into even smaller pieces to customize the fit. When you are comfortable with how your hat feels and looks on your head, take the sizing tape out while taking note of where the strips were placed. Now carefully peel the back off and then affix the pieces back underneath the inner-liner. As you can see the sizing tape is gently pushing out the inner-liner thus reducing the size of the hat and making for the perfect fit!